You could buy a 50% share of this property for £36,250 through the FairShare shared ownership scheme. See the FairShare illustration below for typical monthly mortgage and rent costs. Excellent end terrace property located just off the Springfield Road in West Belfast. 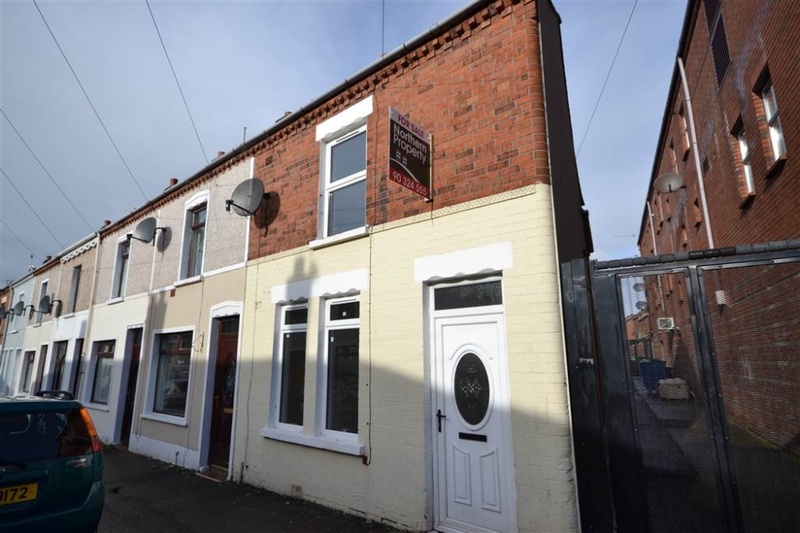 This property has been completely renovated making it ideal for a first time buyer who wants nothing to do but move in. We are in no doubt this property won’t remain on the market for long boasting endless attractive features throughout. Downstairs consists of a large living room, freshly re-painted with modern laminate flooring, under stair storage including ample room for a dining table and chairs. A newly fitted kitchen is one of the highlights of this property, benefiting from beautiful cream shaker style units, Formica work surfaces, vinyl flooring and part tiled walls. Upstairs comprises of two well-proportioned bedrooms, both with newly fitted carpet and neutral decor. The family bathroom is partially tiled consisting of a modern three piece suite with WC, WHB and bath. Additional features include gas heating and double glazing throughout.